English- 7:30pm to 8:15pm in November to February and 8:00pm to 8:45pm in March to October. Chandragiri Fort is the masterpiece of Vijayanagara architecture. Chandragiri is famous for its historical fort, situated 11 km west of Tirupati in Andhra Pradesh. Chandragiri was once served as an important provincial centre of the Vijayanagar Empire. Built in the 11th century, the fort was the headquarters of Narasimha Saluva, the founder of the second line of Vijayanagar rulers in 1485. The Fort also linked with the Aravidu dynasty. The royal and religious structures at Chandragiri occupy an impressive site, on the southern flank of a great 180 m granite hill. Built on a 180 m high rock where earlier fortifications may date from several hundred years before the Vijayanagar kings took over. 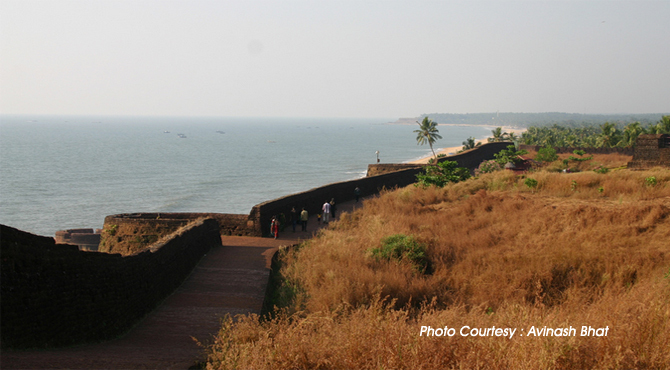 Massive walls with bastions of different shapes, surrounded by a ditch, contain these structures in an irregular Fort. The fort is surrounded by eight ruined temples of saivite and vaishnavite pantheons, Raja Mahal, Rani Mahal and other ruined structures. In 2005, The Archaeological Survey of India (ASI) has added two galleries at its museum on the second floor of Raja Mahal in the Chandragiri fort compound. The North facing Raja Mahal, is the masterpiece of Vijayanagara palace architecture. Compared to the other courtly building at Vijayanagara, Raja Mahal is much larger and one of the finest examples of Indo Saracenic Architecture. Arranged in three storys of arcades, linked by walkways it has a series of corridors, halls and rooms with projecting window balconies. Built with lime-mortar, brick, stone, the Raja Mahal is capped with a domed pavilion roofed by steeply pyramidal tower. Raja Mahal has a audience chamber in the middle which rises through two storeys. The floors are supported by massive pillars while the walls are decorated with stuccowork. The museum in Raja Mahal contains Chola and Vijayanagar bronzes. Near to Raja Mahal is Rani Mahal. Beautifully laid lawns leads to Rani Mahal which is similar to Raja Mahal. Compared to Raja Mahal it is smaller and a different style. There is an inscription on the basement that this was once served as a commander's quarters. It has a domed chamber and an arcaded Verandha attached to the upper storey. It's tower in the middle of the roof is similar to Raja Mahal. Many damaged temples of 15 to 16 century stand near to these palaces which all has small stone sanctuaries capped by pyramidal brick towers with hemispherical roofs. Chandragiri fort houses a museum displaying the sculptures and culture of Vijayanagar. There is also a Sound and Light Show with Amitabh Bachan's voice. There are two shows, one in Telugu (6:30pm to 7:15pm in November to February, and 7:00pm to 7:45pm in March to October) and the other is an English commentary (7:30pm to 8:15pm in November to February and 8:00pm to 8:45pm in March to October). Entrance fee : Rs.30/- for adults and Rs.10/- for kids. Fort Museum Entrance fee is Rs.2/-. Friday is a holiday. Video: Rs.25/-.